Los Angeles Traumatic Brain Injury Lawyer Allen Vaysberg has extensive resources and a genuine, caring attitude towards our clients who have suffered traumatic brain injuries. My promise as a lawyer is to assist you in dealing with all of the critical details, carefully managing each phase of your case, so that you receive the maximum compensation that your are entitled to under California law. Our firm carries a reputation of being fully committed to you, whether it’s the attorneys involved with your case, the members of our support team in the office, the investigative team, our medical advisers, or the wide range of experts and specialists we might bring in to work on your case. Over the years we’ve seen the positive impact this kind of philosophy, practiced in very real terms, has for our clients. When do Traumatic Brain Injuries Occur? A traumatic brain injury is an injury that can affect a person’s cognitive functions due to some trauma. It can include various symptoms ranging from fatigue and headaches, all the way to memory loss and other physical, behavioral, and emotional difficulties. Traumatic brain injury cases can occur in different ways. The traumatic brain injury can occur when an external force impacts the brain. The severity of the injuries depends on the mechanism that caused the injury. These traumatic brain injuries can be caused by auto accidents, falls, assaults, sports activities, or other mechanisms of impact. Although the level of severity may vary, any traumatic brain injury should be taken extremely seriously as the brain is essentially the most important organ in the human body and immediate medical care should be sought. Sometimes people don’t realize the long-term effects right away. It can be very difficult to assess the full extent of the injury at first, or they don’t see the proper specialists for a while. They may not realize that their injuries are more involved than just a headache or a concussion. In such situations, the injured person may not realize why they’re having certain changes or difficulties in their life until later. The brain CT scan is a good investigation method to diagnose intracranial lesions after a traumatic accident or head injury. In determining the value of a traumatic brain injury claim, various factors must be considered including: establishing the basis for the at fault party’s liability, the nature and extent of injuries sustained to the brain including future prognosis and necessity of further treatment, and the existence of and the amount of applicable insurance coverage that may or may not be in effect to cover the loss. Medical bills incurred including but not limited to: emergency room bills, ambulance bills, doctor bills, x-ray bills, MRI bills, CT-scan bills, cost of other diagnostic studies, neurologist bills, surgery costs including the surgeon’s charges and the facility’s charges, and physical therapy bills. Future medical bills that will be incurred based on needed future medical treatment related to the traumatic brain injuries suffered. If the injuries sustained are serious enough, a life care plan may be necessary to calculate the cost of care for the rest of the injured person’s life. Loss of earnings due to missed time from work and/or gainful employment due to the traumatic brain injuries sustained. This also includes earnings will be lost in the future due to limitations and/or inability to earn the same income. Impaired earning capacity due to traumatic brain injuries sustained. Pain, suffering, grief, anxiety and inconvenience both past and future due to traumatic brain injuries sustained. Loss of consortium damages can be claimed by the injured person’s spouse for the loss of the injured person’s love, companionship, comfort, care, assistance, protection, affection, society, moral support as well the loss of the enjoyment of sexual relations. Medical and related experts such as neurologists, neurosurgeons, neuroradiologists, neuropsychiatrists and neuropsychologists. 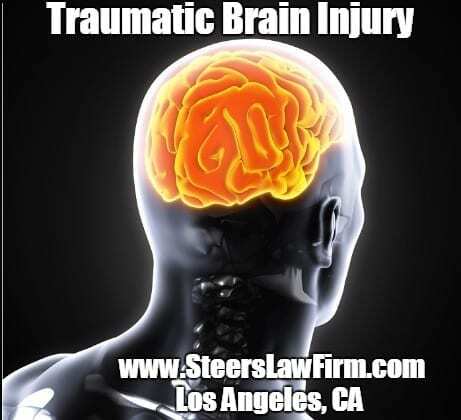 The traumatic brain injury attorneys in Los Angeles at the Law Offices of Steers & Associates apply a dedicated and personal approach to assisting those who have suffered from an accident due to someone else’s negligence. Our lawyers are veterans in trial law, and approach the legal process as something we can control, not the daunting development that most of our clients envision when we meet. We provide calculated and strategic experience that allows us to deliver the proper settlement from the responsible party, their insurance company or broadened financial sources. Each Los Angeles brain injury lawyer in our firm is practiced and analytical in their research and development skills, which allow us to absorb each particular detail and circumstance of your brain injury, its cause and ramifications. Armed with this intelligence, our attorneys are able to face any corporate lawyer with precision and a team of insurance company lawyers with confidence. The brain injury attorney team in Los Angeles at the Law Offices of Steers & Associates will aim to transfer you and your family’s heartache, pain, suffering and physical infliction into a winning case against the negligent party. Our goal is to provide a dedicated resource of confidence and positivity to the brain injury victims we represent, so they are able to focus on healing and getting their lives back. As their families are able to relax knowing that someone is going to bat on their behalf, we concentrate on success in the form of financial restitution. The Law Offices of Steers & Associates has experience representing clients who have suffered traumatic brain injuries and know what it takes to overcome the tactics of the insurance companies. If you or a loved one has suffered from a brain injury due to someone else’s negligence, it is imperative that you retain an experienced attorney today for help. Our veteran attorneys are dedicated to helping brain injury victims recover from their horrific injury as smoothly as possible. The Law Offices of Steers & Associates offers our legal services with traumatic brain injury cases on a contingency-fee basis. When a settlement for damages is secured, the firm’s legal fees will be covered by an agreed upon percentage of that financial compensation to the client. If you or a loved one has sustained a traumatic brain injury, contact our offices today to schedule a free consultation. The statute of limitations or deadline to bring a lawsuit in a traumatic brain injury case in California is the same as in other types of injury cases. Generally speaking, in California there’s a two year statute of limitations, meaning there is a two year period from the date of the incident to file a lawsuit for injuries, including in traumatic brain injuries. Now there are some exceptions. If a person has claimed that a governmental entity – like a city or a county, or a state agency, or a state – caused the injuries, the timing is likely going to be different. If someone sustained traumatic brain injuries due to the dangerous design of a road, or a dangerous condition of public property, or a bus driver caused the injuries, then generally speaking the injured person has six months to make a written claim with the governmental or public entity. After that is done, there is only so much time after that to file a lawsuit if the public entity responds or denies the claim. If there is no response after the claim is made, then the person would still have two years to file a lawsuit, but we still recommend that they do it sooner than that in case a response is provided by the public or governmental entity, but not received by the injured person or their attorney. Also, if it’s medical malpractice that results in traumatic brain injuries, then the statute of limitations is one year from the date the injured person knows or should have known about the injury, or three years from the date of the injury, whichever is the earlier date. In medical malpractice cases, a notice of intent to sue must be given to the health care provider who the lawsuit is to be filed against with a 90 day required notice provision before a lawsuit can be filed. Am I entitled to compensation for my brain injury, or one suffered by a family member? People who have suffered traumatic brain injuries can be entitled to compensation by showing that their injuries were caused due to wrongful and/or negligent conduct of someone else. If that is the case, compensation may be awarded for their medical bills and the cost of future medical treatment. Lost earnings may also be compensable, as well as future lost earnings or impaired earning capacity. Any pain, suffering, grief, and anxiety related to the traumatic brain injuries suffered in the incident or event could also be compensated in the form of money damages. The injured person’s spouse can also seek to recover loss of consortium damages, which is measured by looking at the harm caused on the marital relationship due to the injuries suffered by the injured person. Of course, if the person dies from their injuries then that could be a wrongful death case. In a wrongful death case, the appropriate surviving family member or members can bring an action for the loss of the society, affection, and companionship of the deceased. Essentially, the measure of damages is determined by looking at the relationship that they no longer have with the deceased person who suffered death due to the wrongful action of some other person or party. How much money is a TBI case typically worth? Every case is different. It depends on the damages and injuries to that particular person. It also depends on who the claim is being made against, how deep their pockets are as far as how much insurance coverage they have, or if they’re a company or person with assets. The greater the harm caused to the injured person, the greater the potential value of his or her case. This is because the greater the harm, the greater the loss. We focus on the particular person by looking at what harms and losses they have sustained. Of course, in every case, you have to prove that the other party or person is legally responsible is the cause of the harms and losses. If I’m injured and had a TBI, who will pay for my medical expenses? If you can show that the traumatic brain injury was caused by somebody else’s wrongdoing and that person has a significant insurance policy or is a company with sufficient financial resources, or if the injured person has their own applicable insurance, then that can possibly cover some or all of the damages. If the injuries are caused by somebody else, and they were in the course and scope of employment when the incident happened, then the employer could be held responsible. The responsible parties have to pay, basically. One limitation on that is if there’s not enough insurance coverage or assets of the responsible party. Then that could create a problem in realistically being able to recover the full value of the case. Generally, under the law, if you break it, you’re responsible for paying, so to speak. If you’re responsible for causing harm to somebody else, then legally you should be held responsible for whatever the harm is. What are some common misconceptions that people have about traumatic brain injury cases? Some people may not always know why they’re having cognitive, emotional and/or social difficulties. The extent of impairment can be established in certain cases through medical experts and other experts in order to show that such symptoms and difficulties are related to a traumatic brain injury. Are experts necessary in every traumatic brain injury case? Every case is different but various types of experts are commonly used. A neurologist can give an evaluation of the person’s condition or complaints. A neurosurgeon may be needed toperform a surgery. A neuroradiologist may be utilized toanalyze abnormalities using neuroimaging techniques. Neuropsychiatrists and neuropsychologists have their own specialized areas of inquiry. It just depends on the particular situation. Liability experts such as an accident reconstructionist or a safety engineer may also need to be retained depending on the facts. How do you establish liability in these types of cases? To win a traumatic brain injury case and receive money damages, you need to establish liability first –that the other person and/or parties caused the harm. Establishing this is fact specific on a case by case basis. Basically you need to show that the Defendants failed to act in a reasonable manner and that their failure to do so caused the harm to the injured person. There are also situations where a Defendant intentionally causes the harm. What if we have a child that’s suffered a traumatic brain injury? How would the process differ? The process has similarities to an adult that has suffered a traumatic brain injury in the sense that there needs to be appropriate medical treatment and expert evaluation and testing done to help establish the limitations and harms sustained to the brain and the functions that the person is no longer able to perform. Children have a longer life expectancy than adults. Children with traumatic brain injuries could potentially be entitled to large money damages depending on the severity of their injuries and the future treatment and care required due to the injuries. What are some of the immediate steps that someone could take if they have been hurt in a TBI? If someone is experiencing symptoms that are consistent with a traumatic brain injury, then they definitely need to seek out appropriate medical treatment as soon as possible. Also, of course, if the trauma or event that is causing these problems was from an incident caused by someone else’s wrongful or negligent conduct, then I would always recommend the injured person talk to an attorney to see if they have a viable claim. During the time of the accident, is it like any other situation where someone has to go and fill out an accident report or something like that? Like a slip and fall for instance, is it one of those things that they actually have to go and fill out paperwork for it? Let’s say someone has been put into the hospital; are they going to be subjected to all this paperwork that they’re going to have to fill out? If it’s serious and they had to be taken to the hospital after the traumatic event, it’s likely that there will be emergency room records and possibly a police report. Such records can be obtained if the injured person is not in the right condition to fill out an incident report at the scene. If there was a loss of life, then an appropriate family member can have legal standing to pursue a claim for wrongful death. What would you say are the most common types of brain injuries? They can range from mild and/or moderate to severe. It just depends on the nature of the trauma and the event that caused the trauma. I should add that even a so-called mild traumatic brain injury can still result in cognitive and behavioral issues that can really impact someone’s life. What additional symptoms are the result of a more severe brain injury? If the injury is considered to be a more severe traumatic brain injury, then there could be additional difficulties. Examples include cognitive difficulties, like retaining information and functioning with speech, executive function and forgetfulness, acting impulsively, confusion, lack of concentration, acting aggressively, and epilepsy. It is also not unusual for there to be social difficulties and emotional difficulties in addition to behavioral difficulties and cognitive difficulties. These problems are often magnified when the injury is considered to be a more severe type of traumatic brain injury. Are there other physical impairments as well that can go along with both mild and severe traumatic brain injuries? Yes, physical impairments can certainly be present as well. There can be physical injuries and impairments both in so-called mild traumatic brain injury cases as well as severe traumatic brain injury cases. The extent and scope of such injuries vary because every person is different and every person’s brain is different. The impact of a traumatic event on one particular person and the effects on that person’s brain can be very different from that on another person. Based on what we know about the brain and awareness, can a brain injury result in permanent injuries for an individual? It can be permanent for some people, of course, depending on the mechanism of the impact on the brain – the external force, the impact to the brain that caused the problems – whether that’s due to auto accidents, or to falls, or assaults, or other mechanisms of impact. Because the brain is such a unique an organ, if there’s damage there then a person’s functions may never be quite the same. There are different therapies that may be available to try to have the person function as best or as normal as possible after trauma. That’s what makes certain traumatic brain injury cases very tragic with treatment being a necessity for the rest of the injured person’s life. Would you say TBIs are common, or are they more of a rarity in the average injury case? We don’t see them in every case of course. These are specific injuries. If someone has symptoms of a traumatic brain injury, they should see specialists like medical and related experts. Examples would be neurologists, neurosurgeons, neuroradiologists, neuropsychiatrists, and/or neuropsychologists. Traumatic brain injury cases typically require coordination with various experts and specialists. Life care plans are often required when some suffers a traumatic brain injury. A person with traumatic brain injuries may need to meet with a vocational rehabilitation expert to receive a plan of action if the person can’t return to their previous line of work. An economist may need to be hired if a person has lost income and will experience future loss of income and/or impaired earning capacity. These injuries really can impact someone’s life greatly with devastating effects. Do you see more of the milder ones, or more of the severe ones? It really just depends on the trauma and it depends on who contacts us. Definitely there are some more on the milder side but they can still have severe consequences, and there are definitely more severe cases of traumatic brain injuries as well. Do you only represent clients in Los Angeles? We represent TBI clients anywhere in California. That said, many of our clients are here in Los Angeles or the nearby cities of Beverly Hills, Pasadena, Glendale, Alhambra, Whittier, Encino, Hollywood, Moreno Valley, Huntington Beach, Garden Grove, Fontana, Baldwin Park, Long Beach, Riverside, San Bernardino and around Southern California. Complete the form below for a call back!